Agents discovered nearly 4,700 pounds of marijuana aboard a panga boat off the coast of San Diego. Agents thwarted a maritime drug smuggling attempt off the coast of San Diego Wednesday when they seized more than $2.8 million worth of marijuana from a panga boat, officials said. The bust happened just before 1 p.m. about 38 miles off the coast of San Diego, near San Clemente Island. Officials say agents from Customs and Border Protection’s Office of Air and Marine (OAM) spotted two men in a panga boat during a routine patrol. An OAM Black Hawk helicopter, Interceptor vessel and U.S. Coast Guard cutter were called to the scene to investigate. 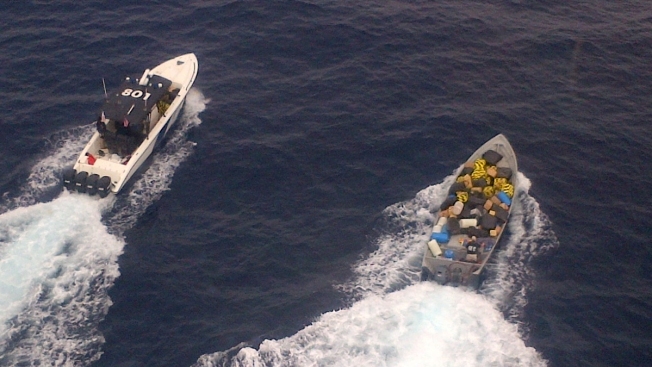 When agents boarded the panga, they discovered 216 bundles of marijuana aboard the vessel. The bundles weighed nearly 4,700 pounds. Officials say the marijuana haul had an estimated street value of $2,800,800. The pot was confiscated and the two men aboard the panga, both Mexican nationals, were turned over to Homeland Security investigators.